On offer is a superb United Kingdom 2005 Gold Proof 4 coin set struck and issued by the Royal Mint. 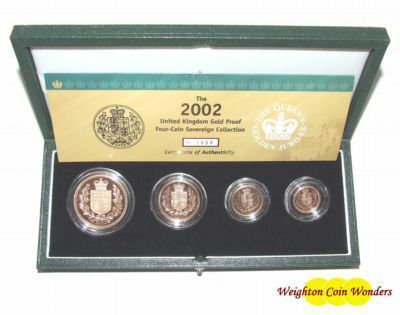 The set contains the £5 Coin, £2 coin, the full sovereign, and the 1/2 sovereign as struck for the the year 2002. The 2002 set is especially desirable as all the coins in the set have the SHIELD REVERSE design which was used for THIS YEAR ONLY. All coins are struck in 22 carat gold. There were only 3000 sets to be issued, and with this being a special design edition, it makes this a very desirable collector's set. All coins are absolutely beautiful and housed in the Green leather box, with the full colour booklet / certificate of authenticity (see photo). 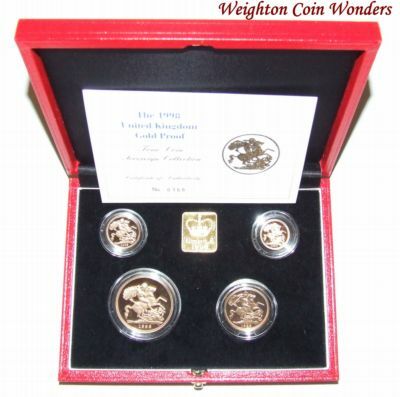 The Individual coin weights are as follows, £5 - 39.94g, £2 - 15.98g, sovereign - 7.98 g and the half sovereign - 3.99 g.